In a response to five fatal shark attacks in Western Australia over the past two years, SAMS (Shark Attack Mitigation Systems) joined forces with the University of Western Australia’s Oceans Institute to find a practical solution for shark protection. I find it very interesting that the main purpose of this research was to protect sharks firstly, humans second. Shark attacks are prevalent because the traditional black wetsuit paired with the way humans swim, would lead sharks to mistake humans for injured seals. In an attempt to save dwindling numbers from human slaughter, SAMS has created two types of deterrent patterns to protect both the wearer and the shark. These designs use “nature’s technology, based on high contrast-based banding patterns.” While sharks have a number of receptors used to hunt prey, studies have shown that vision in the crucial sense in the final phase of attack. The patterns are designed to be unrecognizable or warnings sign to the shark. 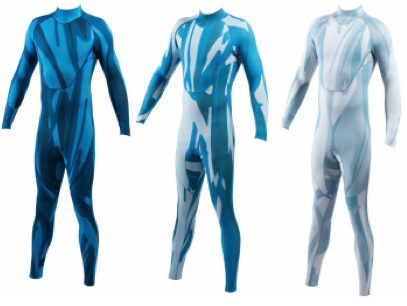 The three types of blue water-like camouflage suits are called the Elude Design. The pattern is hard for the shark to see and allows the wearer to blend in with the background colours of the ocean. The Diverter design, black and white stripes with blue, is a blend of precise contrasting and coloration, which presents the wearer as something unpalatable or dangerous. The diverter pattern is also offered as stickers for surfboards and dive tanks. Both patterns are meant to allow the wearer time to leave the water, as being in the presence of sharks is fundamentally dangerous. In doing further research, I discovered this is not the first type of wetsuit using patterns to deter sharks. Veronica Grey has partnered with Boz wetsuits to bring the Shark Boz wetsuit to market. Her patent pending design is based upon the colourings of the poisonous banded sea snake, the sharks’ lethal enemy. 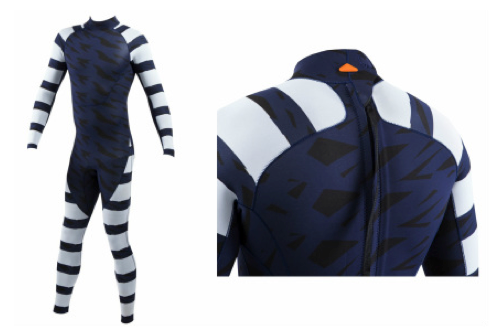 I would be more likely to purchase a SAMS patterned wetsuit because the design is based upon hard scientific data.